Tottenham Hotspur midfielder Tom Huddlestone's red card against Norwich has been rescinded after a successful appeal to the FA. Substitute Huddlestone was sent off by referee Mark Halsey for a 90th minute tackle on Jonny Howson in Saturday's 1-1 home Premier League draw. 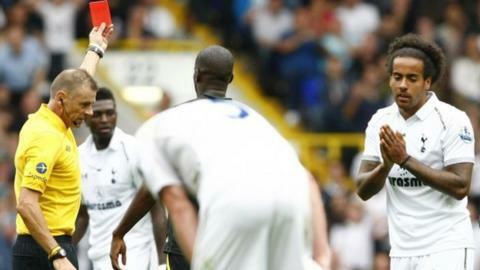 Spurs contested the red card and the FA has withdrawn his three-match ban. Huddlestone, 25, has suffered with ankle problems and was making his first appearance for more than a year. He is now available for the London club's next match at Reading on 16 September.